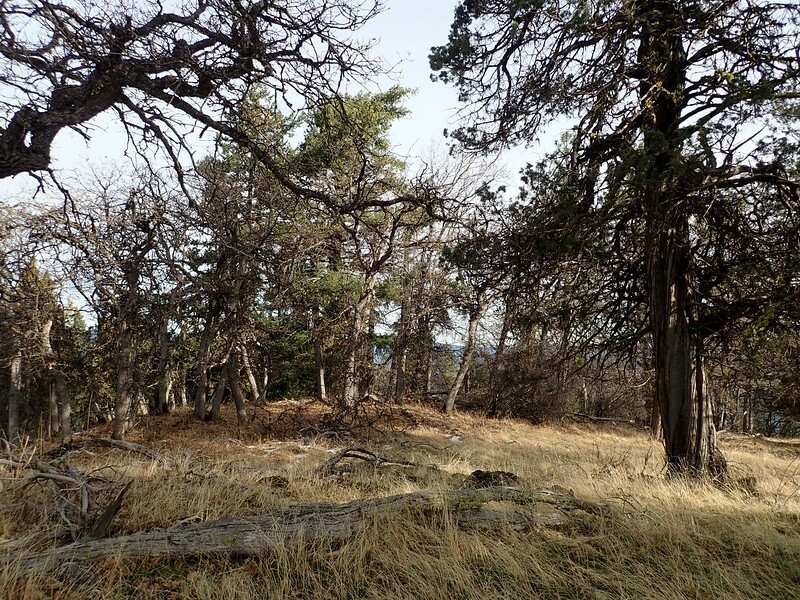 The Soda Mountain Wilderness, which was established in 2009, is divided by a powerline corridor into two pieces. 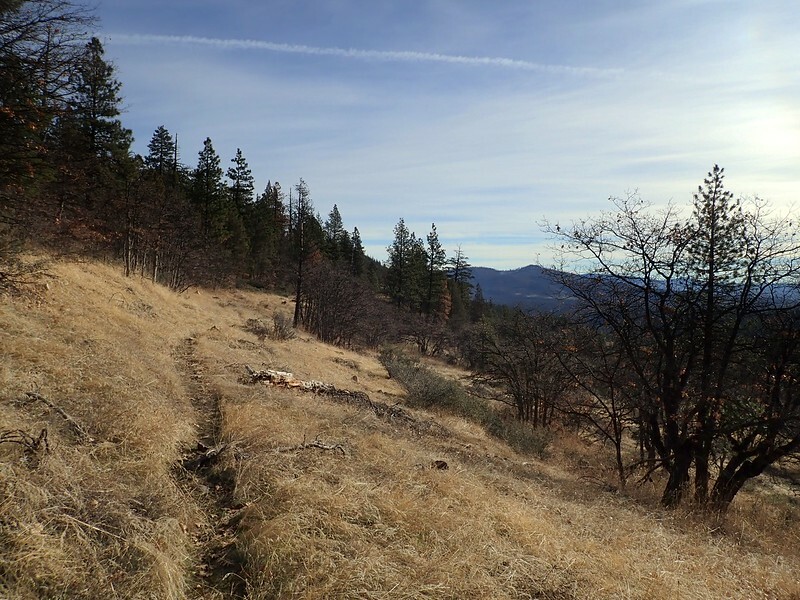 The larger, western piece hosts some of the best known hikes in both this wilderness and in Southern Oregon: the Pacific Crest Trail (PCT), the Lone Pilot Trail, the Pilot Rock Trail, and the Boccard Point Trail. The eastern piece, where oak and pine forests transition into the state’s eastern desert, has no formal trails and is less well known. Jenny Creek, which has been suggested for Wild & Scenic River status, and the former Box O Ranch are perhaps the best known of the eastern area’s offerings. 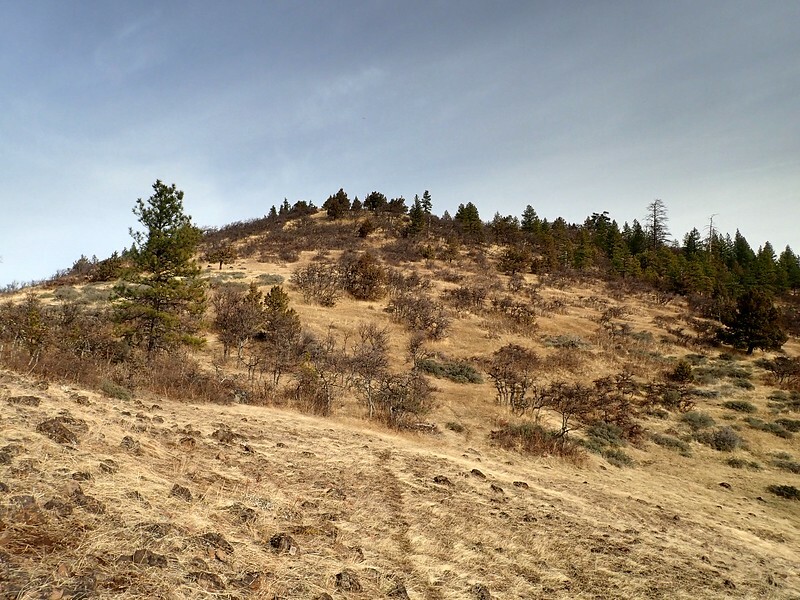 Having hiked extensively in the western piece, we decided to take advantage of our no-snow-yet-December to do a short reconn hike in the eastern piece, to the summit of Rosebud Mountain on the edge of the Oregon Gulch Research Natural Area, which is within the wilderness. 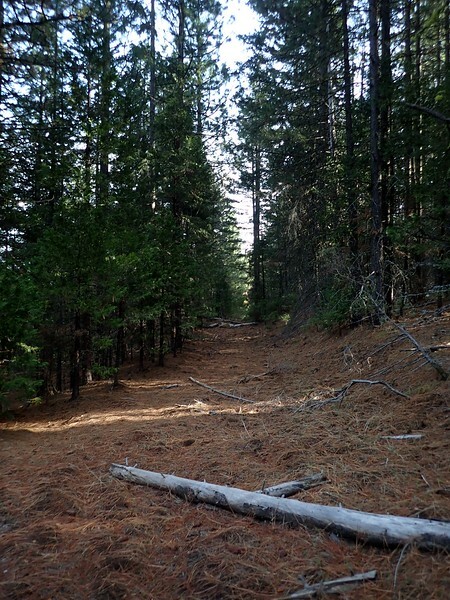 Access to this part of the wilderness is via Mill Creek Road (Bureau of Land Management (BLM) Road 40-3E-12.1) that leaves Highway 66 just west of the tiny hamlet of Lincoln, Oregon. 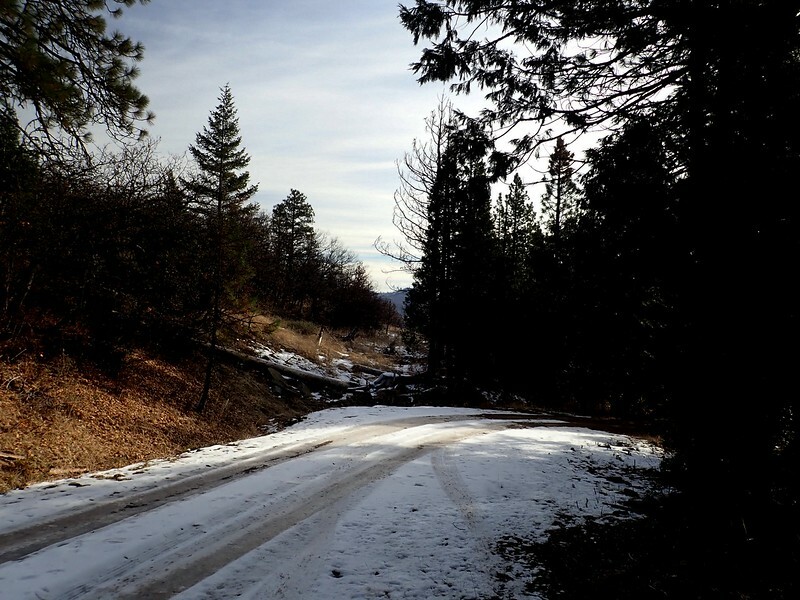 Perversely, this dirt road was the only place where snow had found a home and there were spots where it was a comfort to be driving a high-clearance 4 x 4 truck (in summer, this road would be no problem for passenger cars). This road is gated at the wilderness boundary but we stopped short of that and parked just below Randcore Pass. 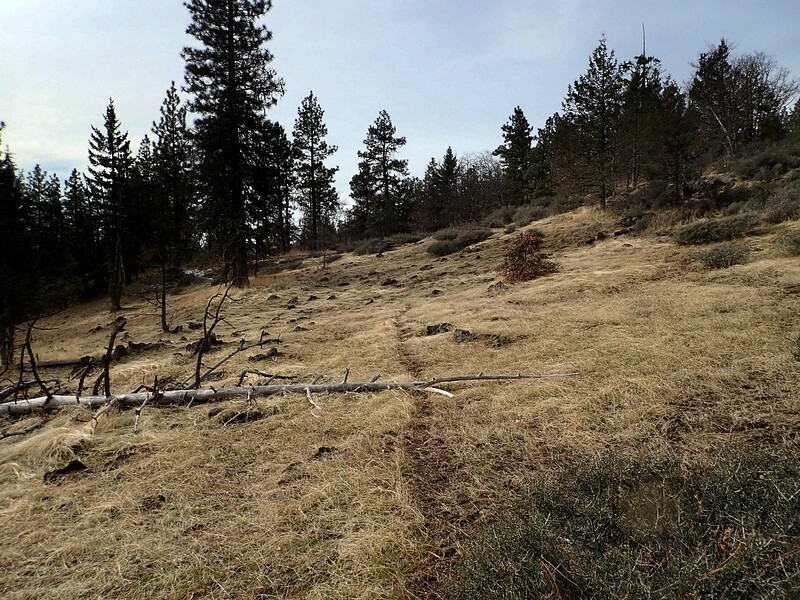 An old road – still shown on USGS topo maps and visible on Google Earth – heads due east from here. An easy to follow use trail now follows the fully decommissioned road prisim. 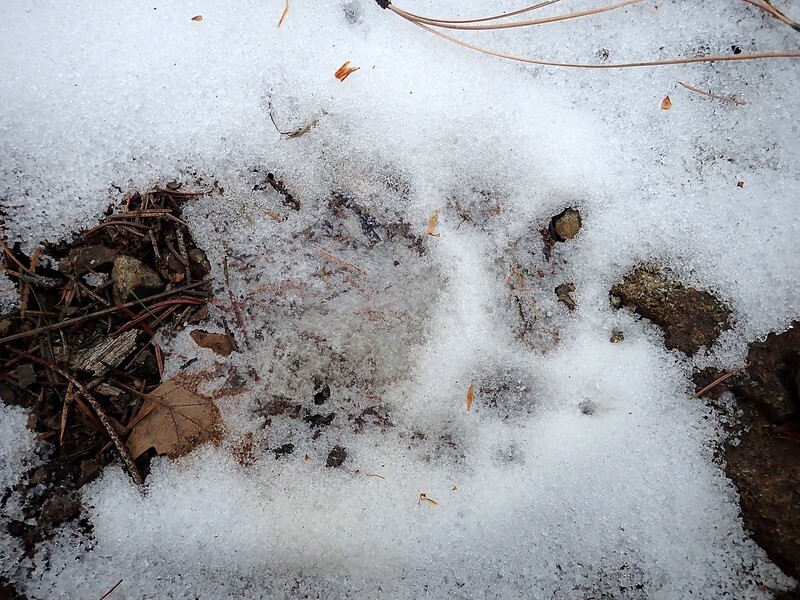 and a veritable blizzard of bear tracks (and fresh bear poop) in what little snow there was here on the north-facing slopes. and climbed its open, grass-covered slopes up to a little stand of trees on its broad summit. This would be a pleasant place to camp if you brought water up with you. 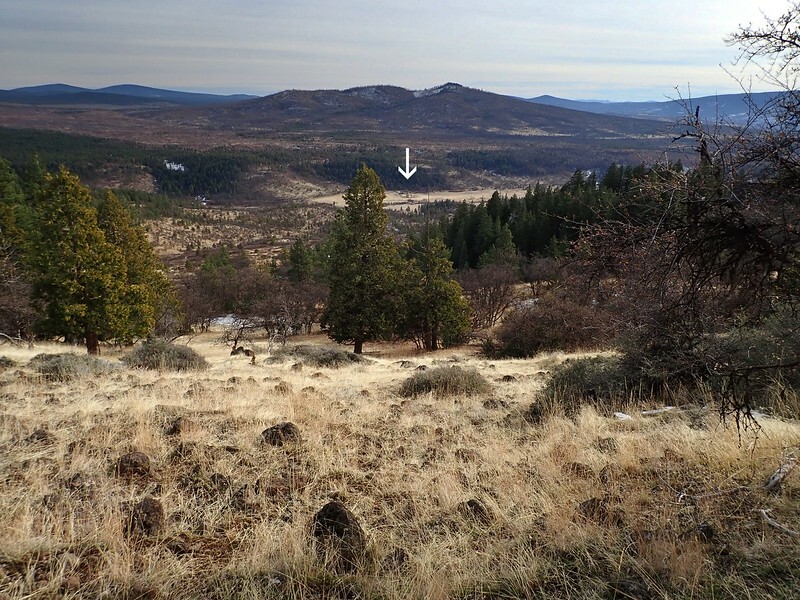 From the southeastern edge of the summit, we could look down on the Jenny Creek drainage and the former Box O Ranch. 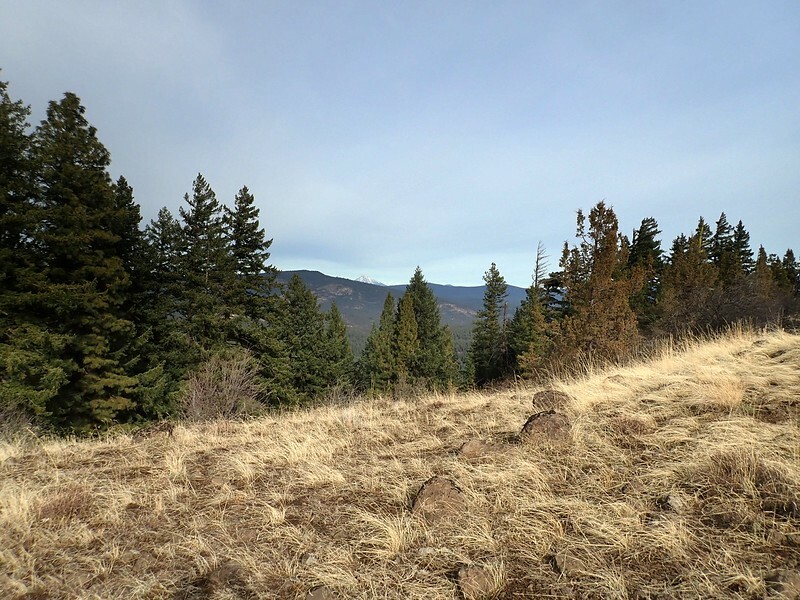 The BLM acquired the 1,200-acre ranch via a fair-market land exchange in 1995 and has been undertaking restoration work along Jenny Creek ever since. 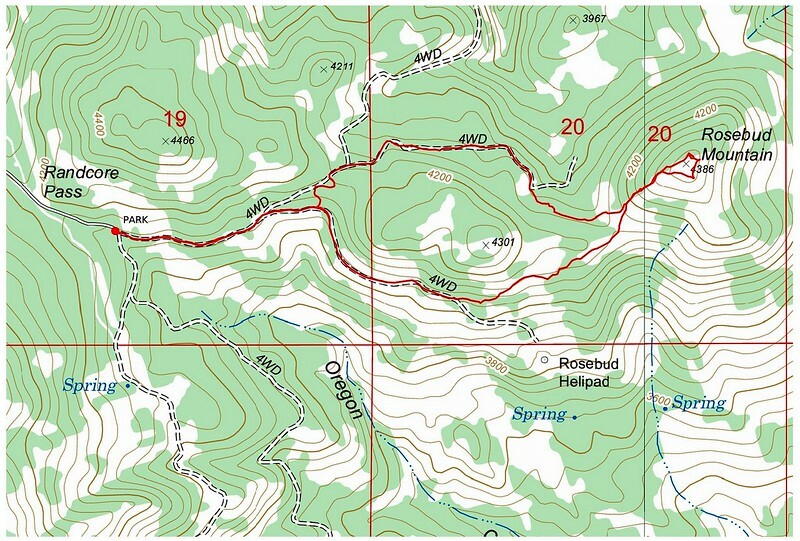 It is now included in the Soda Mountain Wilderness. 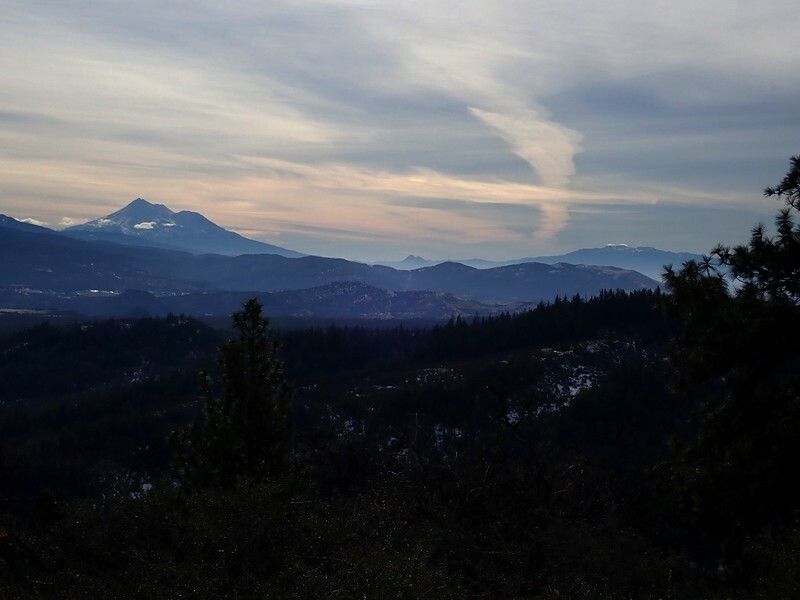 and to the south, despite some haze and glare, Mount Shasta. We dropped southwest off the summit with the idea of going cross-country around the south side of Point 4301 back to Randcore Pass. 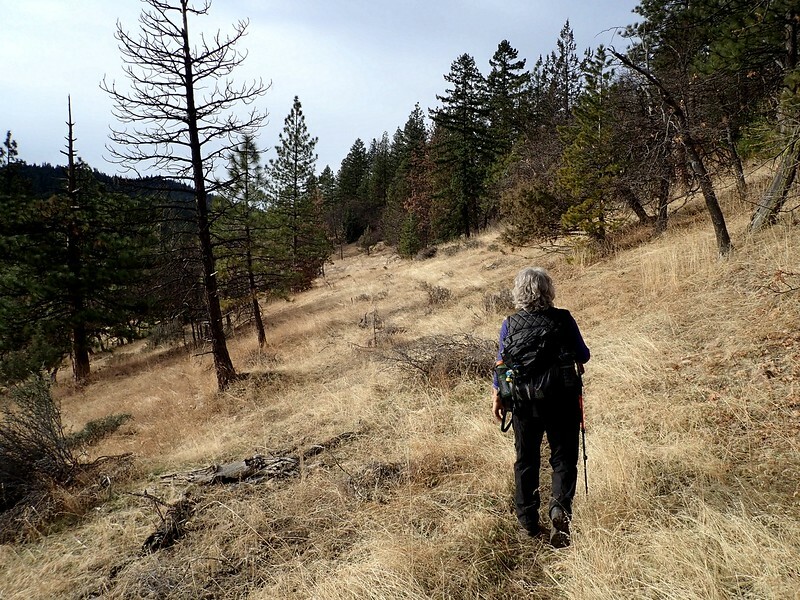 This is easy country to travel in, particularly if you find an obviously well-used deer trail waiting for you on the saddle just west of the peak. and followed that back to Randcore Pass. 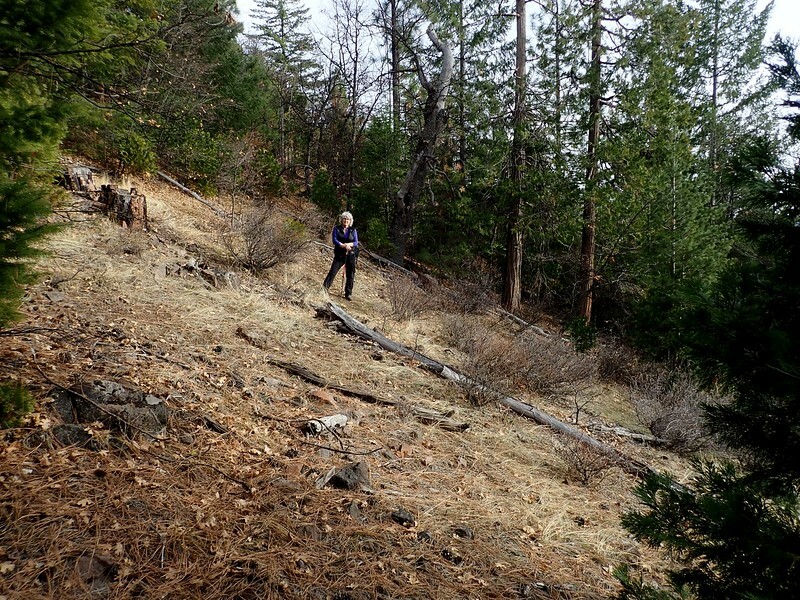 A short (3.7 miles; 700 feet of elevation gain) hike but a great introduction to a new piece of a beloved wilderness. There are other old decommissioned roads here (and deer trails too) and we’re making plans to come back in the Spring and do some more extensive hiking. Today’s hike was short enough for us to have lunch at the Green Springs Inn on Highway 66. Excellent food and pie!